Shannon Phillips, MD is a general pediatrician and pediatric hospitalist with particular interests in the inpatient care of medically complex children and the overall family-centered approach to patient care. She has been recognized as a “Top Doc” since 2006 and is a Senior Fellow in Hospital Medicine. 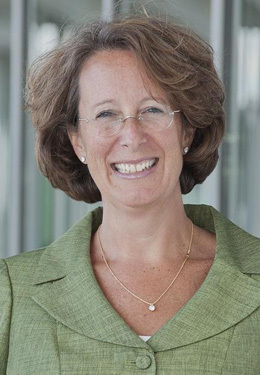 She was Cleveland Clinic’s first Patient Safety Officer and until recently served as Associate Chief Quality Officer. Dr. Phillips is currently a physician lead in the Office of Clinical Transformation. “For me, professionalism is naively simple; it’s about relationships: the patient-physician relationship; my relationship with the other members of the team – nurses, pharmacists, respiratory therapists, you name it. These relationships are complex and my responsibility to the patient is to make sure that all of those relationships align and center around what he or she, the patient, needs. And that’s it. I get up every day to meet or exceed that expectation of myself and others around me. Professionalism is relationships to me. It’s as pure and simple as that. I’ve always practiced in an environment where there are people learning. I’m constantly watching the maturation of people’s relationships; watching people connect and making sure we are centered on the needs of the patient and that we involve the patient as a member of our team. As a teacher, I try to influence those relationships, molding my residents’ approaches with their patients – their language, their physical presence, making sure they meet patients where they are and ensuring we are not talking over their heads. Sometimes it’s helping residents manage their relationships with colleagues from another area and reflect on how that may or may not be going well. While many times those connections are easily made, there are times when we don’t hear each other very well and when we don’t speak to each other very nicely. Whenever that reaches the patient, I consider it a failure on my part. As doctors, we’re often really good at speaking but we’re not always great at listening. We play a lot of telephone tag or electronic handoff in health care, sometimes to our detriment. People are trying to do the right thing but as many times as we pass off information, sometimes it loses voltage. Over a recent weekend, my resident called me (appropriately so) and said, ‘We’re just not making any headway. We’re just not able to get this MRI scheduled.’ So I called the radiology staff member, my colleague, and said, ‘I don’t know what’s not working but I know this very sick patient—probably the sickest patient on the floor in the children’s hospital—hasn’t received the study she needs. I’m not sure what broke down in our communication to your team but can I tell you the story?’ I shared it with him and he said, ‘Wow, this is not how it was conveyed to me. She’s sick. We’ll get her right down.’ Of course, she was whisked away. At the time I grew up in medicine, if you were having difficulties with something, you just figured it out. Bothering your staff with such a thing was a sign of weakness. Now, the best thing that happens to me is that a resident will reach out and say, ‘I’m stuck’, or a respiratory therapist on the floor will call me just to talk when they are worried about a patient. He feels connected to me, as a part of a team and is able to just call and say, ‘Hey I’m concerned about this’ without worrying about bothering me. It’s the little things that build relationships. For instance, when a caregiver is scared about a patient, she does not hesitate to call you. I don’t know if, in medicine, we have always been good at finding physicians who were tuned into the power of relationships. The prized attribute was autonomy: ‘Get out of my way! I’ll take care of it.’ At the end of the day, I don’t think that will get it done. I can make a decision and take control of a team; there are certainly times when that is needed but those are relatively rare. If we are purposeful in building strong relationships with each other and we commit fully to the relationship with the patient, I don’t know how we can’t do well. The sum of these continuous ‘small’ interactions is the powerful connection between the patient and her caregivers.